This much is clear: nearly everyone loves chocolate. 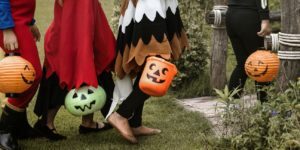 Americans buy millions of pounds of it at Halloween every year, so its reputation doesn’t really need much more support. With chocolate basically at the top of the Halloween candy food chain, it’s easy to forget just how many other types of candies are available at Halloween. Here at Blair Candy, we’re proud to carry a large variety of Halloween candy for your holiday enjoyment, and today, we’d like to highlight some non-chocolate favorites. You know that perfectly sugary sweet Jolly Ranchers taste? Doesn’t it go well with the tangy Twizzlers flavor? If you think so, check out Hershey’s assorted mini sweets this year! 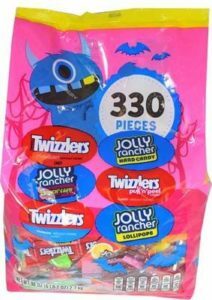 Each bag contains 330 pieces of Twizzlers and bulk Jolly Ranchers, perfect for handing out to every trick-or-treater who comes to your door. On that same note, what about a party candy bag mix from Wonka? Each bulk bag contains 150 pieces of SweeTarts, Nerds, Laffy Taffy, and Everlasting Gobstoppers, a wonderfully sugary selection of candies, with not a drop of chocolate! If you really love your bulk Jolly Ranchers, why not take them with you on the go with Jolly Rancher lollipops? Just for Halloween, each of the 20 lollipops in the bag contains a spooky image imprinted onto it, such as a ghost or bat. This Halloween, dare to be different with some non-chocolate sweets. Shop all Halloween candy at BlairCandy.com! Have You Tried These New Kit Kat Bars for Halloween? Kit Kat Dark: Dark chocolate fans will absolutely love these Kit Kat bars. Instead of its normal milk chocolate coating, the wafer candy is coated with a dark chocolate layer instead. This adds a dark new twist to this delicious candy! Definitely try one of these with a hot cup of coffee…we guarantee you”ll love it! Kit Kat Halloween Orange: We love when candies change up their appearance for holidays! These Kit Kats decided to be more festive and have an orange coating instead of its usual milk chocolate. This is a white chocolate coating, so it still tastes about the same as its original counterpart. 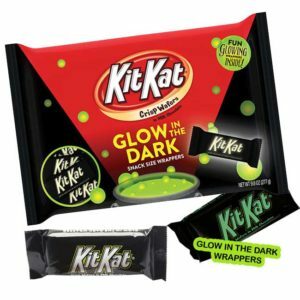 Kit Kat Glow in the Dark: We know what you’re thinking…glow-in-the-dark candy? As cool as that would be, this is the next best thing! A regular, super delicious Kit Kat bar, but this time with a neat glow-in-the-dark wrapper. Which do you think you’ll run out of first? Be sure to try all of these and stock up before Halloween is over! Shop these Kit Kats and plenty of other festive candies today at BlairCandy.com! Sour Patch Candy Corn: These gummy, mellow cream candies have grape and orange flavors and a generous coating of sour sugar to make the perfect candy corn substitute. 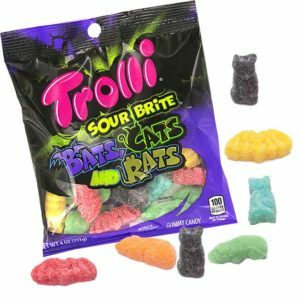 Trolli Bats, Cats, and Rats: Trolli basically invented the sour gummy candy, so it’s only natural that they make delicious sour Halloween candies. This mix has fun bats, cats, and rats that are coated in sour sugar and made up of fruity flavors. 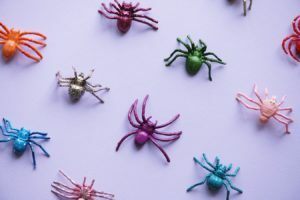 Hairy Spiders: Scare people with these sour gummies! This bag of hairy spiders is an assortment of colorful gummy candies with an extra layer of sour sugar. Eat alone or add to some dirt pudding cups for a spooky snack! Which are you most excited to try? Do you want an essential bag of sour gummy worms? Giant gummy candies that will surprise even the sour candy fans? Start shopping now so you get to enjoy those sour and sweet treats sooner! Stock up on these and other gummy candy treats today by visiting us at BlairCandy.com! Halloween crafts only add to the fun during fall! 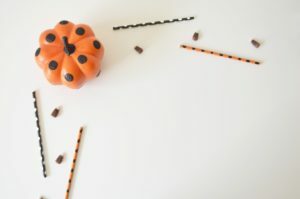 Whether you’re looking to make a few things for your Halloween party or if you’re looking for something easy the kids can make, these crafts are easy to make and use wrapped Halloween candy that’s in your kitchen right now! 1) Coffee Filter Ghosts. All you need is lollipops, coffee filters, a marker, and ribbon for this one. See how to make these cute Coffee Filter Ghosts on the Happiness is Homemade blog here. 2) Candy People. Kids can get very creative when making these candy people. Lay out an assortment of wrapped Halloween candy and let them go! Check out how these candy people are made on the Cute as a Fox blog here. 3) Witch’s Brooms. Looking for a clever way to hand out candy? These Witch’s Brooms are the perfect solution. Learn more on what you need and how to make them on the Two Crafting Sister’s blog here. 4) Candy Costumes: Everything else is festive for the holiday, so why shouldn’t your candy be, too? These printable “candy costumes” are simple ways to make the candy haul of Halloween be even cooler. See how on the Sugar and Charm blog here. What will you make? Before getting out the tape and scissors, stock up on all of the Halloween candy you need at BlairCandy.com! When you think Halloween candy, what’s the first candy that comes to mind? For many, it’s gummy candy, especially gummy worms. 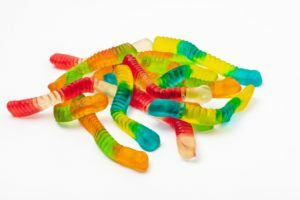 Gummy worms are the classic, creepy-crawly candy that kids love and adults are typically a little grossed out by. But how did these gummy candy classics come to be? Gummy candy was first developed by a German candy maker in 1922. However, the gummy worm didn’t make it to candy stores until the 1980s by Trolli. The goal was to make a candy that kids would go crazy for, but adults would find gross. There are so many varieties of the gummy worm. There are the regular gummy worms, which have two to three flavors and three stripes of color. Sour gummy worms tend to have the same colors and flavors, but can also be of a pastel variety. There are also jumbo gummy worms that can be upwards of three pounds! People even use gummy worms for desserts, such as the classic dirt pudding. We’ve also seen gummy worms frozen into popsicles, jello desserts, or made for adults by being added to alcoholic drinks. How much do you love gummy worms? Be sure you have plenty of this gummy Halloween candy this year by visiting us at BlairCandy.com. Oreo Fun-Sized Candy Bites: Oreo’s are a popular cookie for a reason, so it’s not hard to see why these are going to be big this holiday. Each bar has a chocolate shell with an Oreo cookie cream center. Snickers Pumpkins: Snickers made their delicious candy bars even more festive with these pumpkins! This is still the milk chocolate, peanut, caramel candy you know and love, just with a fun twist. Glow in The Dark Bars: It can be hard looking for the candy bar you want in your treat bag. Make things a little easier with these glow-in-the-dark candy bars! The bars itself aren’t glow in the dark, but their wrappers are. Both Kit Kat and Hershey bars have these options, so be sure to check them out. Reese’s Ghosts: Obviously, you have to have Reese’s Cups in your candy mix. They are the most coveted candy of the holiday that kids and parents both love. Change things up just a little bit with white chocolate ghosts with delicious Reese’s filling. There’s plenty of other treats you should try! Visit BlairCandy.com today to check out these and other popular wrapped Halloween candy for trick-or-treating. Throw The Scariest Halloween Party with Gross Candy! – Gummy Body Parts: Can you get any creepier with this candy? Each bag contains a mix of gummy body parts in assorted fruit flavors. Find gummy teeth, bones, fingers, feet, brains, and skulls in this candy assortment. We also have a bag of just gummy eyeballs, because sometimes you need extra eyeball gummies for decorating desserts and scaring your guests! – Gummy Critters: People will be grossed out when they see gummy spiders or gummy rats in your candy bag! Or you can really spook people with giant gummy snakes hiding on your dessert buffet. Either way, these gummy critters add to the atmosphere of the holiday. – Bug Lollipops: Do you think your guests will eat a bug? Challenge your guests for a creepy, sweet contest with some lollipops that have bugs inside. Choose from tequila worms, ants, or crickets for a gross candy challenge. – Candy Fangs: End the night with a set of candy fangs! These are a great party favor because they’re both a costume piece and candy. Just make sure you get a couple bags to ensure that there’s enough for everyone. 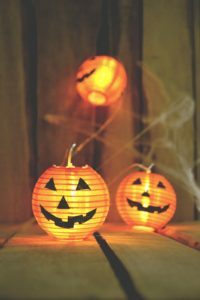 Check out all of our creepy candy at BlairCandy.com! You can stock up on candy for parties, trick-or-treating, or your Halloween favorites for your household. Shop now and start trying all of our gross, creepy treats today. Stock Up On These Parade Candies for Halloween! – It’s always good to have fruity candies that won’t melt if conditions get too warm. Candies like Jolly Ranchers, Frooties, Starburst, and Lemonheads are all delicious options that everyone loves. – You have to have chocolate! 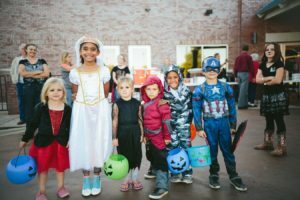 From regular milk chocolate Hershey bars to delicious Reese’s pumpkins, these are the candies that kids (and parents) love! Plus, some of the wrappers glow in the dark, making them easy to find in the treat bag later. – Classic or retro candies are always fun, as many kids get to try these nostalgic treats for the first time. Pick up some Mallow Cups, BB Bats, Peanut Chews, and Caramel Creams for a nostalgic taste this Halloween. – Don’t forget the staple candies! Chewing gum in bulk, lollipops, and gummy candy are always good to have around, as everyone tends to love them. Plus, these are all easy to save for later if they don’t get eaten right away. Shop all of our parade candy in bulk for Halloween by visiting us at BlairCandy.com! There you’ll find a huge selection of bulk wrapped and unwrapped candy, perfect for parades and large parties. Which will you choose for your spooky festivities? White Chocolate Candy Corn M&M’s: These were just made for fall. The M&M’s come in white, yellow, and orange – the candy corn colors, of course – and are coated in white chocolate, a scrumptious combination. 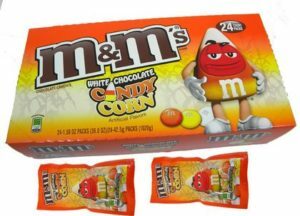 Get your white chocolate candy corn M&M’s today, and enjoy them throughout the Halloween season! Mike and Ikes: How many flavors of Mike and Ikes do you think you could pass out this Halloween? Choose from tropical fruit, sour, caramel apple, or the original fruit flavors to snack on. Don’t worry about portioning out these candies: each bag contains multiple fun-sized packs. Hot Tamales: The older kids in the neighborhood will love these! This classic cinnamon candy is perfect for fall thanks to its warm flavor. Keep it simple with the original flavor or try its version of cinnamon apple candy. Which of these candies will you be enjoying this Halloween? Shop all Halloween and fall candy today at BlairCandy.com! Hershey’s Mix: You can’t go wrong with classic Hershey’s candy bars. Choose from a variety that features Hershey Milk Chocolate Bars, Reese’s Cups, Almond Joy, Kit Kats, and more. Or, try a multi pack of one of the new Glow in the Dark candy bars out now! Twizzler Mix: Looking for something with more fruit flavor? Count on this Twizzler Mix to give you a boost during the trick or treating. Mixed with Twizzlers and Jolly Ranchers, this is a great alternative to chocolate candies that can melt or for those with sensitive diets. Boo Bling: Kids will love wearing and eating this candy jewelry! Made up of spooky shapes and colors, these rings and bracelets will be a big hit in the neighborhood. Mike & Ikes: These are a favorites among older kids and adults who have “just taken one piece” from the candy stash. This assortment has original, tropical, and sour flavors, making sure there’s something everyone will love. Grab a few of these candy mixes and some others that you’re wanting to try by visiting us at BlairCandy.com. There you’ll find plenty of new and staple Halloween candy mixes that will make you the most talked about house on the block. Shop now and get ready for Halloween today!